While I love most everything about my Galaxy Nexus, Google made one ridiculous omission in Android 4.0: they removed the ability to set separate notification and ringer volumes. 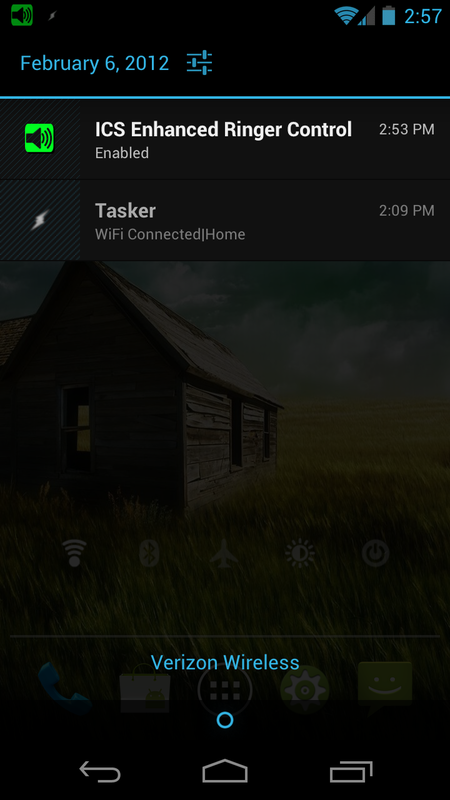 On my previous phone, Tasker was set up to automatically mute notification tones and turn the ringer volume to three at 11:00 PM as long as the phone was on charge. This way, I wasn't bothered with constant email notifications throughout the night, but if someone needed to call during the late hours, it would wake me up. With ICS, however, this isn't possible - the ringer and notification volumes are always the same, no matter what. It drives me nuts. 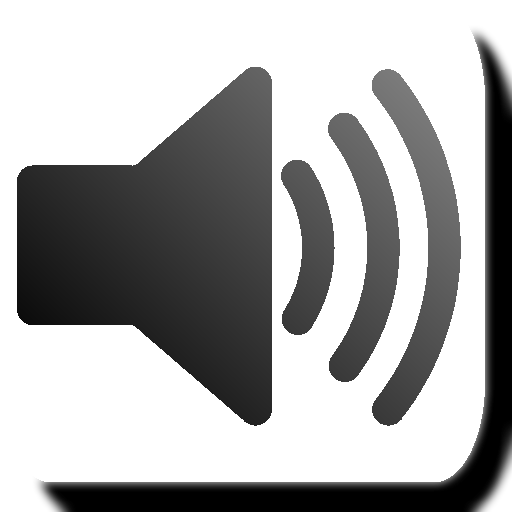 Since this "master volume" controls it all, I have to set it to two at night and hope that the ringer is loud enough to wake me in case of emergency while keeping the notification wake-ups to a minimum. Fun stuff. Then something happened that changed everything: the developer of a new app called ICS Enhanced Ringer Control hit sent us a tip about the new app. It seems that I wasn't the only one completely irritated about this oversight from El Goog - IERC is the answer to that annoyance. This is another one of those simple-yet-brilliant ideas that I love so much. This app is one screen (and a 'help' dialog). Literally. 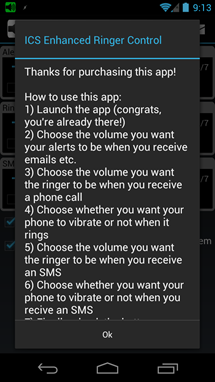 As you can see, the app is about as straight forward as they come - you can set the overall system volume, ringer volume, and SMS volume. 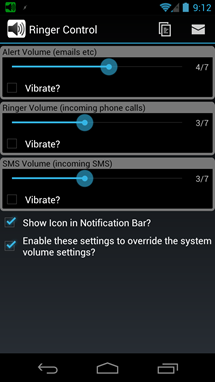 Once you tick the "enable..." box, it overrides the current system settings. 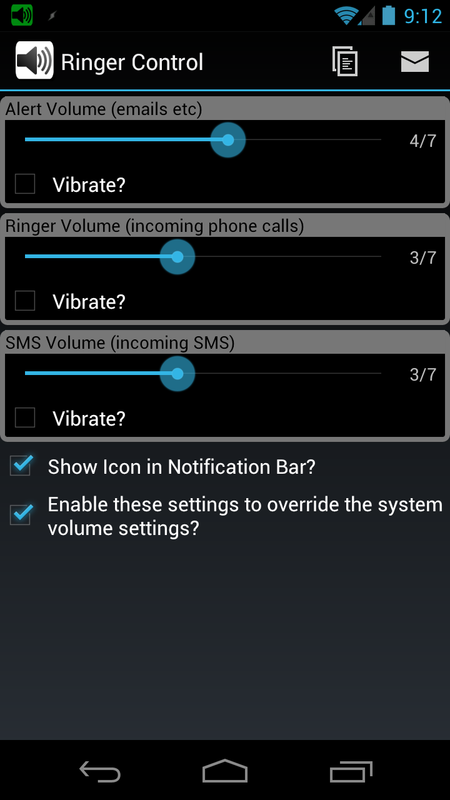 After that, if you adjust the volume using the rocker, it will change the Alert Volume, but leave the ringer and SMS volume as-is. 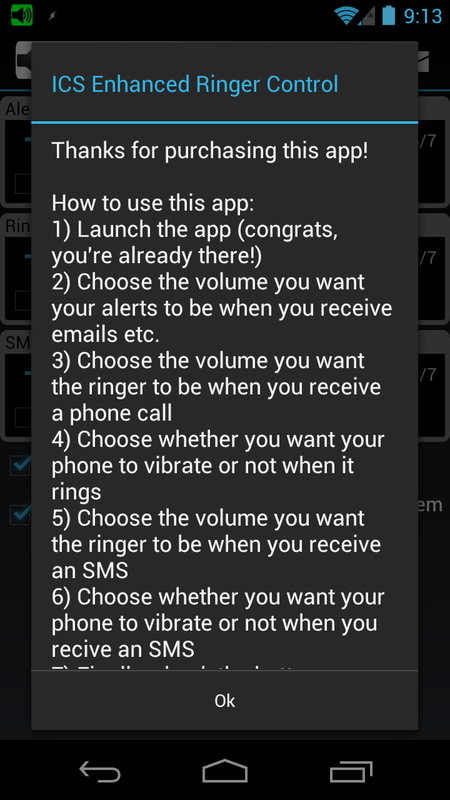 The app also provides a stupid-easy way to quickly toggle vibrations for each different setting, as well. 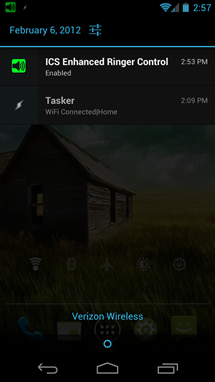 While pinning the app to the notification area comes in quick handy, I wish there was an option to hide just the icon. I don't typically like to clutter up the notification bar if I can help it, so that would be a nice addition to a very useful app. Aside from that one minor annoyance, this app is exactly what I've been looking for since I got my Galaxy Nexus. It's easy to use and does exactly what it was intended to do in straight-forward manner. It's definitely a must-have for all GN owners; do yourself a favor and hit the widget below to buy - it's well worth three bucks.